Future communication networks are envisioned to comprise diverse technologies (i.e. 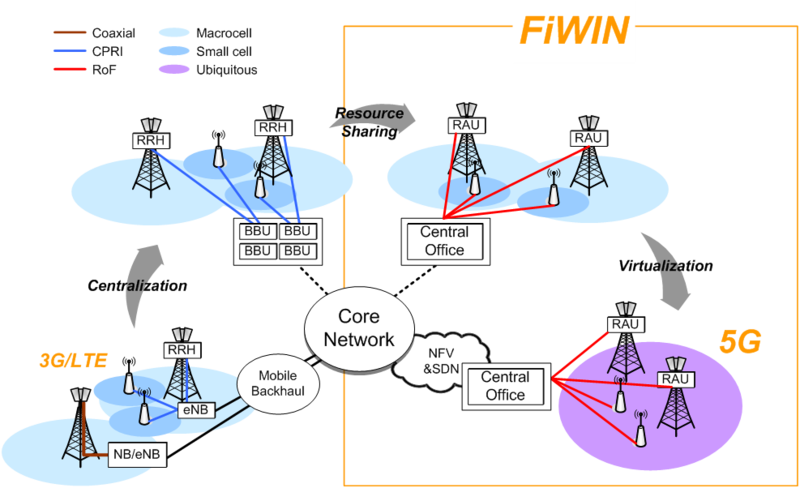 wired and wireless, optical, RF and millimeter waves (MMW)) seamlessly integrated and organized in a variety of cells connecting to access networks and global networks as shown in Fig. 1. One of the principal objectives of Fiber Wireless Integration and Networking research for Heterogeneous Mobile Communications is to explore novel, implementable concepts to increase wireless network capacity, provide higher data link rate at a low latency,and expand the physical reach of mobile network coverage. We propose to achieve these goals by adapting wired optical techniques for multi-service wireless distribution and to generate millimeter wave signals at the microwave and millimeter wave photonics system interface. Fig. 1. Fiber wireless integration and networking to increase wireless system capacity, provide high data link rate, expand network coverage and maintaining mobility by implementing modulation diversity, physical layer encryption, optical to RF and MMW conversion and signal processing in both photonics and RF domains. Clearly, the communication network infrastructure is experiencing continued pressure to accommodate increasing throughput while service providers seek to provide energy efficient services over denser and wider areas of coverage at marketable cost. To answer the projected technical challenges the European Union has constituted the "Mobile and wireless communications Enablers for the Twenty-twenty Information Society (METIS)" consortium comprising 5 telecommunications equipment vendors, 5 service providers, 13 academic institutions, and one automobile manufacturer. While METIS is principally a European consortium, DOCOMO, an NTT subsidiary, and Huawei are also members. In response, China has constituted the “IMT-2020 (5G)" program promoted by a 3-Ministries Promotion Group to establish a 5G platform and facilitate cooperation with foreign companies and organizations. In 2013, the Datang Wireless Mobile Innovation Center published "Evolution, Convergence, and Innovation 5G white paper." Similarly, Korea has constituted the "5G Forum" as a cooperation among south Korea, China, and Japan to set global standards for 5G mobile technology. In contrast, coordinated consortium activity in the Americas is not in evidence. Research in wireless networks in the Americas is taking place in various universities, sometimes as short-term thematic projects with private industry, funded through government grants, or a combination of the two. While the 5G network architecture continues to be debated, many features will be recognized as having evolved from the existing 4G infrastructure, among these are overlapping small cells and macro cells to accommodate increased traffic, pooling of resources at base band hubs for efficient small cell coordination, improved resource and energy utilization, and cost, as depicted in Fig. 2. Fig. 2. Evolution of multi-service radio access networks (RANs) architectures enabled by innovations through Fiber Wireless Integration and Networking (FiWIN). RRH: remote radio head; BBU: baseband unit; eNB: evolved nodeB; RAU: remote access unit; CPRI: common public radio interface; SDN: software defined network; NFV: network function virtualization. Increased fronthaul optical fiber network capacity increases throughput between remote radio heads and base band stations and between these and the central office (i.e. the backhaul). Communication and coordination among macrocells (backhaul) is usually laden with massive data processing overhead, necessary for administrative functions that coordinate and control fronthaul traffic flow. The latency associated with these administrative tasks is under considerable downward pressure. Backhaul administrative tasks include coordinating cell-to-cell hand-offs and the mitigation of radio frequency interference in the vicinity of shared, cell soft boundaries. Clearly innovative solutions are needed. Researchers in the FiWIN center have recently demonstrated the concept of photonics assisted coordination and interference abatement at the cell edge in multi-cell downlink transmission. This is the first time that optical techniques have been used to assist in front-end coordination in mobile network control and administration functions. The theme of using analog optical techniques to affect network control closer to the user will continue to be explored noting that analog processing represents a strategically allocated approach to diminishing network latency.